The South East of Ibiza is possibly the most populated area of the Island. 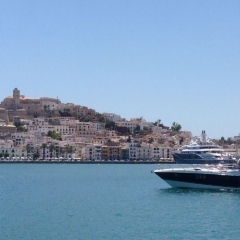 It includes Ibiza Town, Dalt Villa and Botafoch Marina. These places all converge around the main harbour where the ferry port is. The main shops for Ibiza Island are in Ibiza town. Ibiza airport is a 10 minute taxi ride away (or 20 minutes on the bus). There are plenty of places to choose stay in this area as it also includes Playa den Bossa, Talamanca, Jesus, Cap Martinet, Can Furnet and Can pep Simo. 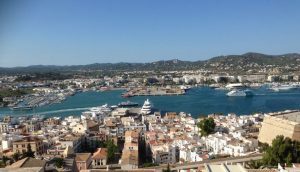 All of thse locations can be reached in just a few minutes from Ibiza Town. The South East of Ibiza offers a diverse type of property and a wide range of styles. In the Old Town and Dalt Villa, you can buy some amazing town houses or apartments within the narrow streets. You are surrounded by lovely local shops, cafe’s, restaurants and bars. In the Summer, the evenings extend into the early hours. If you’re looking to be close to town, but far enough away to have some peace and quiet, areas such as Talamanca, Jesus and Cap Martinet are a great choice.